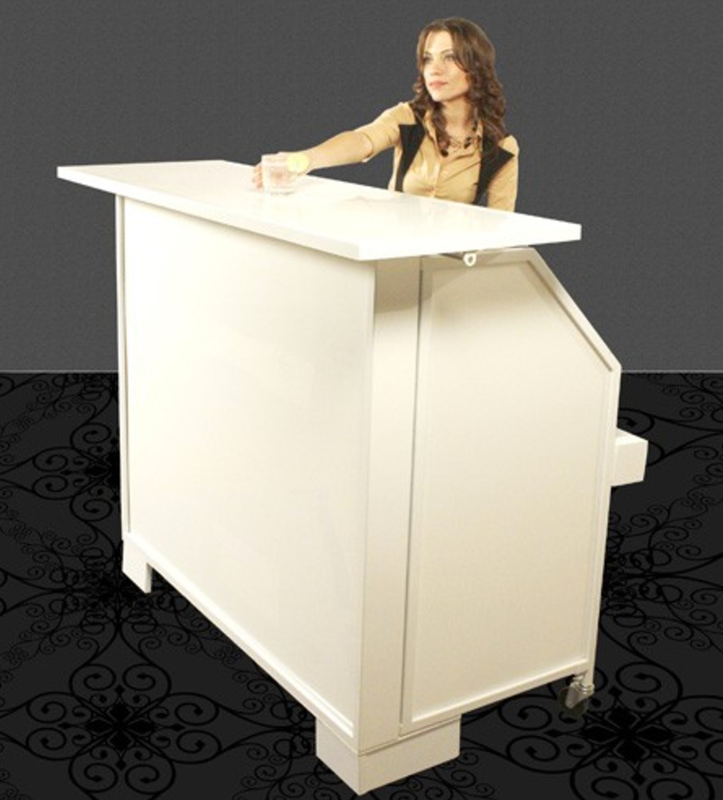 Portable bars are becoming more and more popular as they are so very versatile. Whether you’re a flair bartender, event or mobile bartender, portable bars are an excellent way for you to conveniently move around the city or country showcasing your talents and skills and earning money while you do it. Alternatively, these bars are employed by hotels to use in the catering rooms, banquet halls or lobbies, by home bar enthusiasts who like to entertain friends and by fraternities and sororities who throw regular parties. There really are no limitations to what you can use these home bars for – in addition to birthday parties, weddings and other special occasions, they can be used outside of the bar industry as well. Due to portability, these quick set up bars are ideal for trade shows and markets where they are used to display and sell anything from jewelry to clothing. Below we have listed an array of different home and portable bars along with pictures and features. Some of the mobile bars listed below come with free shipping – click the image or the link in the description for more information. All the bars listed below are sold by our vendor partner BarProducts dot com. We’ll start off with some of the completely portable bars – the ones that break down to fit into an over-sized suitcase that you can fit in virtually any car. Introducing the iMIX portable bar (pictured on left), which has been gaining in popularity, especially for flair bartending competitions. As far as portable bars go, whether you’re into flair, event bartending or just something you can bring out when guests come over to the house, this one has it all. And best of all, setup takes all but a couple of minutes. The bar breaks down to fit into a portable suitcase with wheels and a handy pop-up handle so that you can wheel it to events or in and out of storage. [UPDATE] The iMIX portable bar is no longer available. 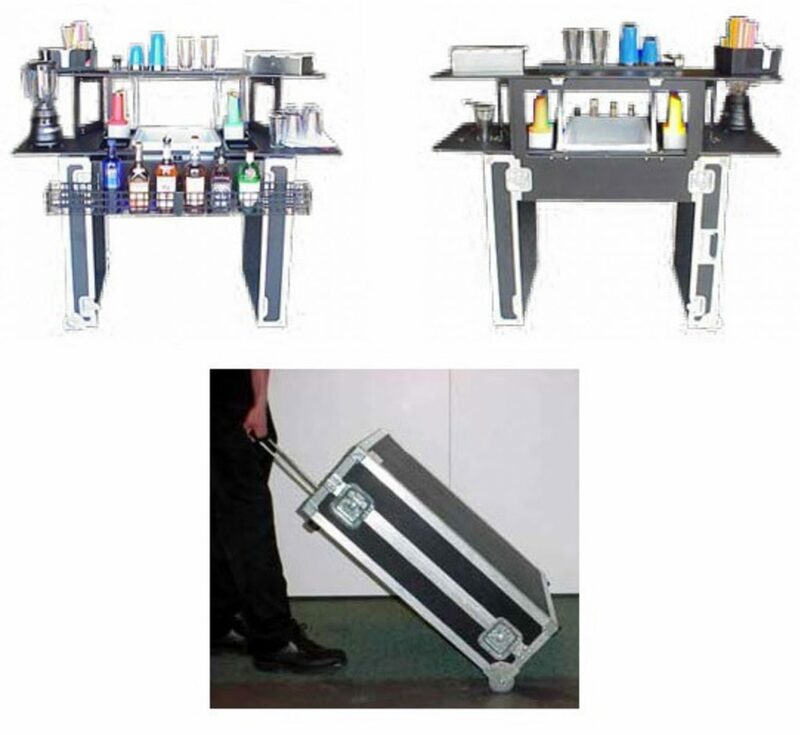 Instead, check out the BarConic portable bar (pictured on right) or the Flairco Portable Bar (pictured below) as a replacement. Click on the image to order or get more details of this bar including a list of materials, measurements etc. 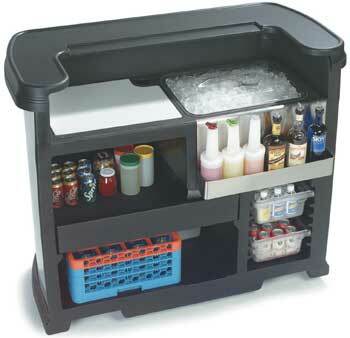 A step above the old iMIX bar, is the Flairco Portable Bar which has more of an open look to it. Still small and portable, it breaks down to fit snugly inside a suitcase just like its cousin, the iMIX bar. If you’re currently a bartender or you’ve been thinking about bartending, this is an excellent bar to practice from and to take on the road to bartend private events. If you’re into flair, you can’t go wrong with this bar – one of the more portable bars of the bunch, it can be set up in under 5 minutes. 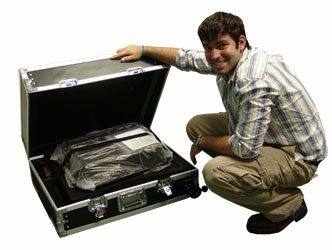 There’s big money in bartending private functions and this bar breaks down into a convenient, rollable suitcase that you can take anywhere. Click on the image to get more info. 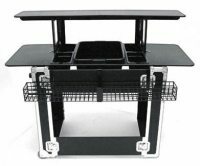 SmartBar Portable Bar – When setup, these folding bars looks similar to the bars above. Some of the main differences, however, are durability and the ease of setting them up. The bars above fit into an oversized suitcase that can be transported in the trunk of almost any car. This folding bar, by contrast, does just that – it folds flat. NOTE: The image on the left was an older model which has been replaced by the folding bar you see on the right, called Smart Bar Portable Bar in a Box. Because it folds flat, its more durable as it has more solid, single sized pieces. So, if you’re looking for something that you can transport in almost any vehicle, take a look at the suitcase bars above. If you’re looking for something to roll out of storage at your house, bar, restaurant or catering event (or if you have a truck or van for transport), than you’ll want to look into this one as a better option. It can be set up and broken down in under a minute and if you’re looking for branding, you can attach a logo, picture or slogan to the acrylic panels or you can get the LED light version you see in the image here. The SmartBar featured here is 3 feet wide. For a larger version, see the SmartBar 5LX below. Full measurements and additional photos, click on the image. The folding ‘SmartBar 5LX’ is definitely a nifty little bar. A bigger version of the SmartBar shown above, this folding bar is perfect for any type of event really – from house parties to clubs, banquets and anything in between. It folds up and comes with a lighting system to set the mood for your event. Features include 2 ice bins, 2 washable cutting boards, a speed well, shelving and a built in multi color programmable LED lighting with remote. 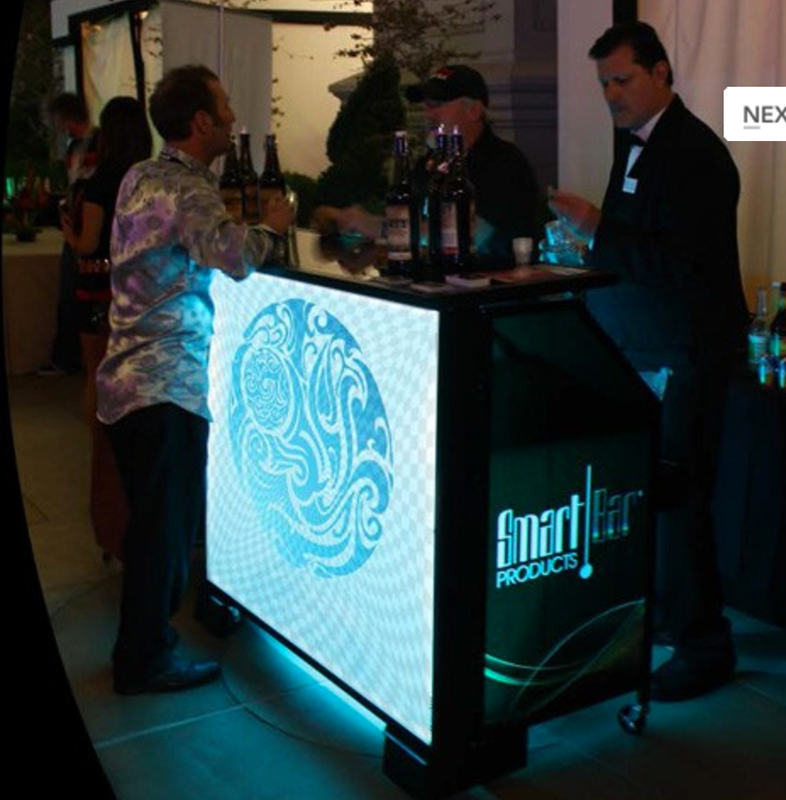 Whether you’re just getting into flair bartending, event bartending or are looking for an additional martini bar for your establishment, the SmartBar 5LX has plenty of customizable advertising space and lots of counter space! 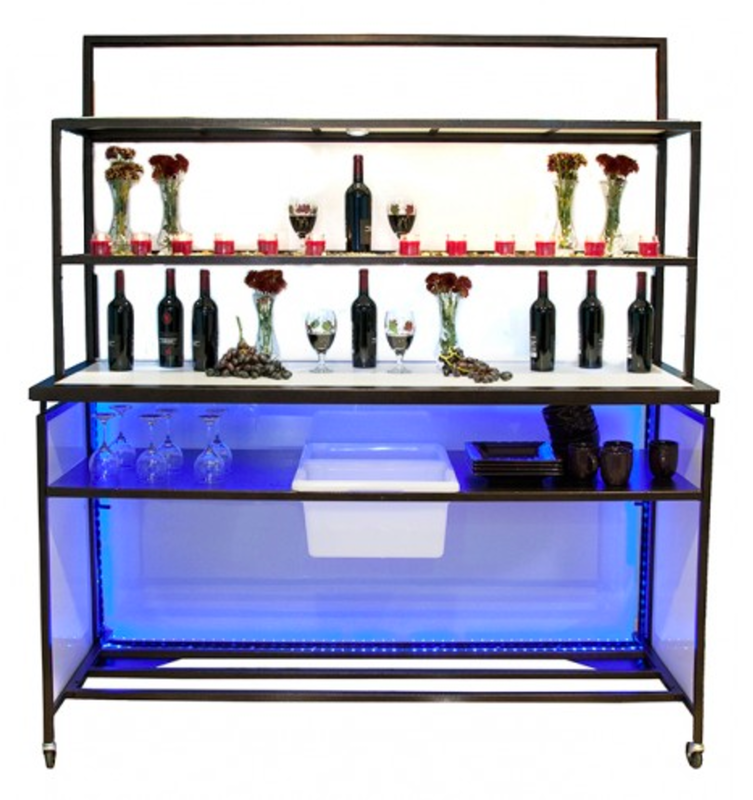 [tw_di[tw_divider type=”line” height=”20"]p> Smart BackBar PLUS Portable Back Bar & Shelves — This LED lit back bar can be used to supplement a bar setup you already have or on its own. This bar is easy to set up and very versatile – it can be used as a stand alone bar, as a back bar or as a serving or buffet table. It comes with a built in LED system, is on wheels, has 2 ice bins plus extra storage space. We see our clients rolling this out during happy hours or food and drink sampling. Setup is quick and easy and the LED lights are programmable and controlled by remote. As with most of the bars on this page, this one comes with lots of open space for advertising. Click the image for more details. [tw_divi[tw_divider type=”line” height=”20"] Delux Stainless Steel Folding Bar – It folds, rolls and lights up! 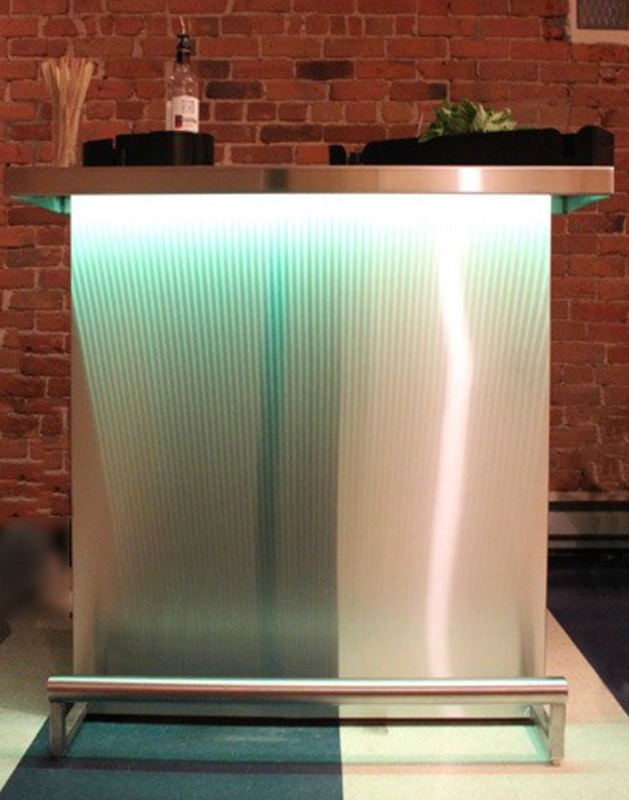 This stainless steel beauty is the cream of the crop when it comes to high end portable bars. Called the Deluxe Portable Bar for a reason – this one comes with LED lights which are controlled by remote control and can be personalized with almost anything you want – photos, slogans or logos. The LED lighting is built right into the bar and allows you to set whatever color you want, depending on the mood and atmosphere you want to create, complete with 3d holographic lighting effects. Made from food-rated brushed stainless steel, you won’t find a more deluxe portable bar than this. Free shipping to most of the United States. Click the image to get more information. I’m sure you realize that what you gain in portability, you’ll lose somewhat in durability. 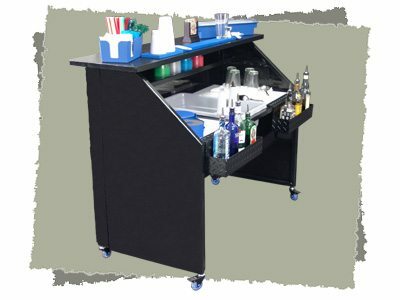 Portable bars range from ones that you can fold flat to ones that you can pack in a suitcase, to ones that you can simply roll out of the way into a storage area. 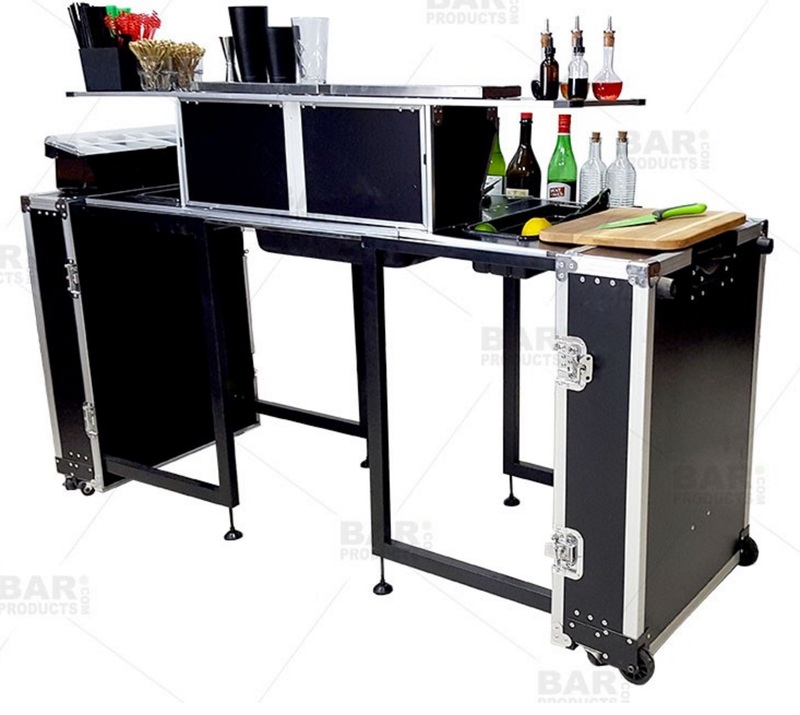 Well, this pro bartender portable bar is the latter – one that comes fully assembled and simply rolls out of the way when not needed. And because it comes fully assembled and is not meant to be broken down, its extremely durable. 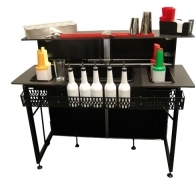 This bar, called the ‘Pro Bartender’ portable bar, is perfect for banquet rooms, lobbies of hotels, beside the pool or out on the terrace for a dining event. What its not perfect for, is to fold up and carry with you to your next event. However, because it doesn’t break down, its extra sturdy and comes with more storage space than the other bars listed. Features for this one include an easy to clean molded countertop, a large 56″ serving area, a molded in bar mat and built in removable cutting board as well as sliding storage drawers to house mixers, sodas or glass trays. Click the image to get dimensions and ordering instructions.